To celebrate the 20th year of the School of Communication and Media Studies, MOP Vaishnav College has organised an International Media Summit on Filmmaking, Inspire 2018, a two-day event focusing on media and filmmaking. CHENNAI: To celebrate the 20th year of the School of Communication and Media Studies, MOP Vaishnav College has organised an International Media Summit on Filmmaking, Inspire 2018, a two-day event focusing on media and filmmaking. It was inaugurated on Thursday by Robert G Burgess, US Consul-General, Chennai, who was the chief guest. Actress and danseuse Vyjayantimala Bali, was the guest of honour, and she also received the Living Legend Award. Lalitha Balakrishnan, Principal and S Anurekha, communication and technical head, School of Media, were present. “India and the US have a great connection when it comes to films. I am very glad that there is such a platform for the younger generation to gain knowledge about filmmaking and communication and pursue it as a career,” said Robert. He also shed light on piracy and lauded the efforts taken by film industries to curb it. 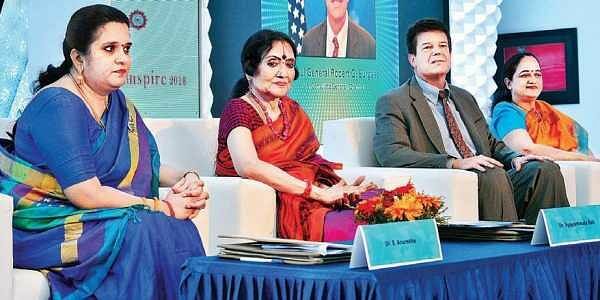 In her speech, Vyjayanthimala shared about her connection with movies. “Cinema is an extension of life, and a beautiful journey. It takes us to places we have never reached,” she said. Students from many colleges in and around Chennai participated in the sessions conducted on the first day. The first session was on art and aesthetics of filmmaking by film critic Baradwaj Rangan. “I believe that there are many elements in a film. Right from paper to screen, every little thing matters,” he said. A question and answer session was held where students discussed about ideas of filmmaking and their perspective on films and aesthetics involved. There was also a discussion on different kinds of production and importance of visuals in movies and art direction. The second session was on the nuances and scope of documentary filmmaking by Annette Danto, Professor, Brooklyn College, USA, and a documentary filmmaker. “Documentary is about collaboration with people and is a platform where people want to share with you,” she said. It was followed by a session on production workshop by Michael Baser and animation workshop by Peter Walsh from Vancouver film school, Canada. While Michael discussed about television production, shows and screenwriting, Peter briefed the audience on animation system, gaming animation, 3D modelling and animation, introduction to animation, contrasting animation techniques between games and movies and more. “The best part about entertainment industry is that there are more opportunities globally,” said Peter. The day ended with an interactive session on cinema and creative freedom by Arun Prabhu, director, Aruvi. He spoke on his journey as a film maker.